Sometimes AFT stories are inspired by figures that are released. Quite often, as in this case, the story comes first and then a way is thought up to make it happen. And stories with kids in are hard to do, due to a lack of kid figures. 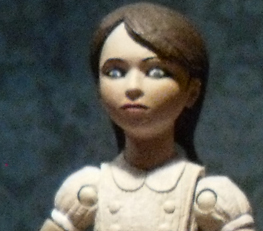 So when I walked into Forbidden Planet one day and spotted the Bioshock 2 Eleanor Lamb figure, I knew I'd found my Emily and Play Time could go ahead. I just had to paint in her eyes. Part one was posted on 26th March 2011 with part two following on 2 April continuing the weekly series of Saturday updates. It was essential for anyone reading the story that Emily should be portrayed as the sweet innocent so I deliberately avoided showing her doing anything bad in the teaser images. Additionally I didn't want to spoil any of the horror elements either. The title was originally Play Time but changed to The Whispering Walls to take the emphasis off Emily. 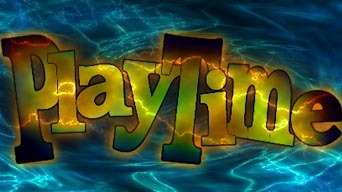 But during the edit I realised that Play Time was the perfect title and had to stay. As with Story 2, this was me thinking about creepy, gothic horror. There is something very creepy about Victorian playrooms and I threw every kind of nasty scare I could. I think Emily is one of the best villains I've created for the AFT. She has no morals at all, not because she's actually evil, but because she's selfish and has never been taught better. Coupled with the limitless power at her disposal she's a monster that you can't reason with, you can only placate her and hope to beat her in other ways. 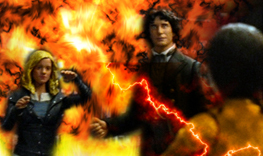 One early idea was that the Doctor and Angel put Emily's book prison in a library where it is stolen by an enemy of the Doctor's who is collecting his recent enemies in order to unleash them on mass in the finale. It's no spoiler to say that isn't going to happen. But I wouldn't rule out a return for Emily at some point in the future. The story I think owes a fair amount to the DWM comic strip Evening's Empire where a teenager harnesses the power of a crashed spaceship. It was by no means intentional but that excellent story was no doubt an influence. 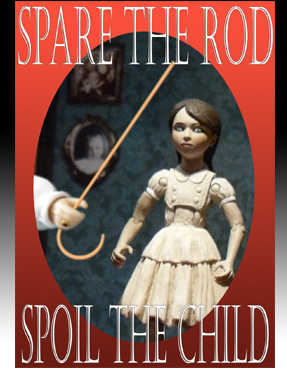 The nursery rhyme that Emily recites in part one is a genuine Victorian children's poem. The attic scenes were done first on 8th November 2010 followed by the hallway where the TARDIS appears. Filming continued on the 9th November with the rest of the scenes in the house. The final shots of the TARDIS interior were done along with all the other TARDIS scenes for the series on 7th Jan 2011. The first storyline had the Doctor in part two chased by animated toys but I wanted something more horrific so I decided that Emily would turn him into a teddy bear. In retrospect, I could have come up with something better for the Antarans themselves but the point was that they are tiny, almost microscopic. Unlike most of the other stories this series, this didn't need any additional dialogue to be added during the edit. The script was pretty much right from the beginning. You may recognise the Antaran ship. It was previously the Godmaker machine from Godmaker. No exact date is given for the story but it's certainly Victorian. The Doctor mentions the plains of enchanted song, a destination he promised to both Sarah Jane and Wun Tun in 2010's White Christmas.